Colonic intussusception in adults is uncommon and intussusception after colonoscopy is rare. 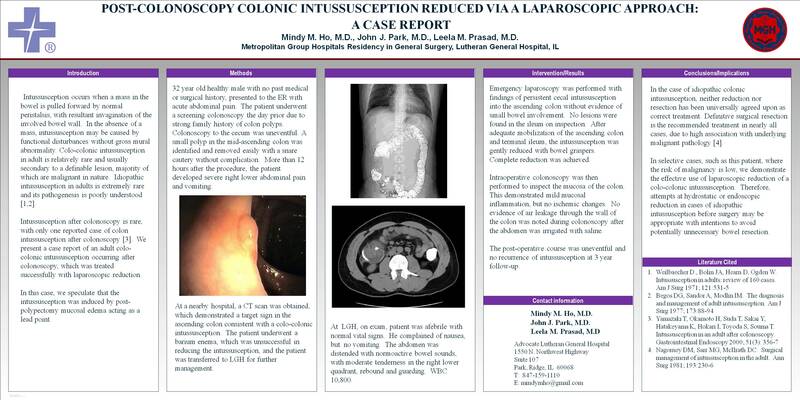 We present a case of colo-colonic intussusception that was successfully treated by laparoscopic reduction. 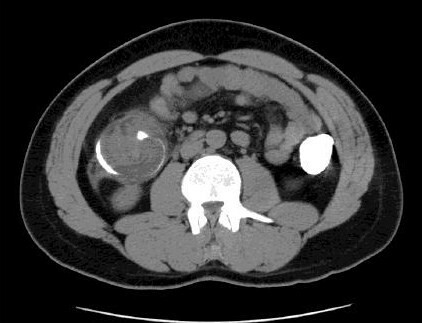 In this case report, we identified a patient who presented to the emergency room with abdominal pain and radiographic evidence of intussusception. METHOD: A 32 year old healthy male undergoes an elective colonoscopy due to a strong family history of colon polyps. A colonoscopy was performed to the cecum, without complications, and a small polyp was removed in the mid-ascending colon endoscopically (Figure 1). Later that evening, the patient experienced severe right lower abdominal pain and vomiting. In the emergency department, CT scan was obtained which demonstrated a colo-colonic intussusception (Figure 2). A barium enema was performed, but was unsuccessful. Emergency laparoscopy was performed and complete reduction was accomplished via gentle laparoscopic retraction. Intra-operative colonoscopy was performed to examine the mucosa and there was no evidence of leak or irreversible ischemia. The patient did well post-operatively. CONCLUSION: Idiopathic colonic intussusception in adults is extremely rare. The recognized definitive treatment is surgical resection, due to the risk of malignant pathology. However, in our patient, intussusception was likely due to post-polypectomy submucosal edema. Therefore in this setting, we conclude that laparoscopic reduction is the preferred treatment option.